At Boutemy, we love to discuss with our clients what enchants them most about Port Grimaud. After having spent 20 years in the village, we are filled with wonder each day with these fantastic surroundings, but it is always nice to find out the little favorites of others. » We chose to visit Grimaud in the morning and Port Grimaud in the afternoon. 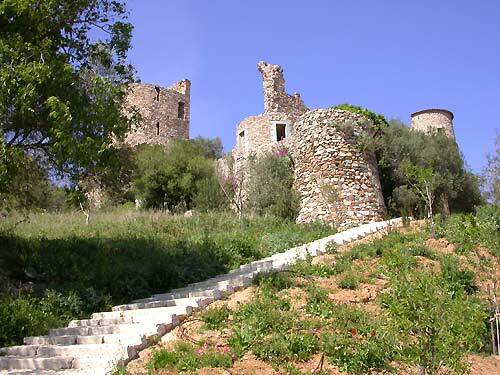 We went there by car because Grimaud is located only 12 kilometers from Sainte-Maxime where we were staying. To avoid the traffic along the sea, I would advise you to go by Plan-de-la-Tour. Once you arrive, you can park in the village for free which has many parking lots available, that Port Grimaud does not have. The village is charming with its paved roads and typical Southern houses. Grimaud is home to a 15th century castle that offers a splendid view of the golf of Saint-Tropez, and an open air theater gives concerts during the summer. After we had lunch in a brasserie, we jumped on the little train to Port Grimaud! This allows you to easily move along the coastline and as you can imagine, my daughter loved it. Prices: One way: adults 5 euros – children 3 euros or roundtrip: adults 7 euros – children 4 euros. Port Grimaud, called the Venice of Provence, is a maritime village. Cars are forbidden (except for residents) and you can visit the lakeside city in electric boat that is possible to drive without a license. It costs 25 euros for 30 minutes. Since we didn’t have enough time, we walked there, which was also very enjoyable. At the end of the afternoon, we took the little train back to the car and went back to our vacation rental. We must do it again with a concert in the ramparts of the castle! We would like to warmly thank Emilie for her help. Grimaud and Port Grimaud are ideal destinations for children who would be entertained by the different modes of transport available to travelers. We hope that she will have the chance to test the electric boats next time because little ones love to drive them (wearing their lifejackets, of course, and with the help of an adult :-). Cette entrée a été publiée dans English, Holidays in South of France le 18 mars 2016 par Boutemyblog.